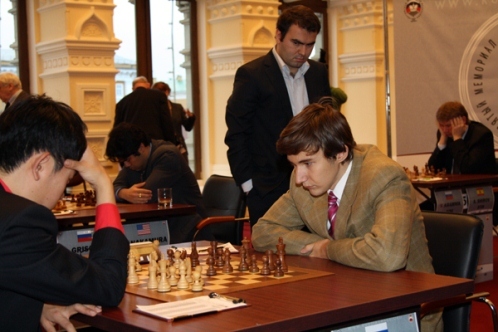 Grandmaster Sergey Shipov was providing his impressions for Chess-News. The photos in this report are taken from two photo reports, one by Anna Burtasova and Anastasia Karlovich at the official website, and the other by Evgeny Surov at Chess-News. You can play through the games in the viewer at the end of Shipov’s comments. A brief summary of the game: Black conceded the centre to White, but forgot to counterattack it. And died by suffocation. But if you want more details… There were, it has to be said, a lot of mistakes. The players were clearly no longer capable of fathoming the numerous tactical nuances and were playing based on general ideas – which often let you down. I can point to one particular theme: Black was too late in dispatching the bishop to h6. On the 21st and 23rd move the continuation Bg7-h6! gave Black equal chances. In the game, however, he played it on the 28th move, when White had already taken complete control of the situation. 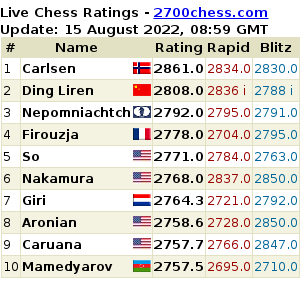 Well done, Gelfand! Better a win late than never. The rare move 8. Rc1 (in the topical Cambridge Springs Variation of the Queen’s Gambit) clearly disturbed Shirov. With 8…Bb4! 9. Qd2 he could have brought the game to known positions, but he decided to take advantage of White’s inaccuracy, as it seemed to him. 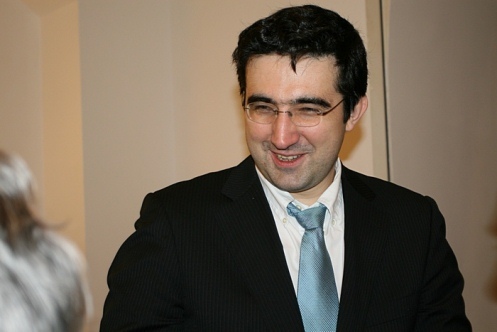 As a result Kramnik successfully tricked his opponent! His move 10. a3! (instead of the expected 10. Qd2) came as an unpleasant surprise. Vladimir managed to get a position with powerful compensation for the pawn. However, on leaving the opening the ex-World Champion committed a couple of inaccuracies, allowing Black to simplify. And then Shirov overestimated his position. With 22…Ba6 23. Rfd1 Nd3! he could have gained a comfortable advantage. From a practical point of view the move 22…g5? is a terrible gamble. You can’t play like that! The computer, of course, is able to defend Black’s naked king, but for a human being that task proved too daunting. And no wonder. The Russian was clearly lucky. The Chinese grandmaster conducted the game brilliantly. He parried his opponent’s risky attack with a principled exchange sacrifice, and after the complications he got a favourable position with opposite-coloured bishops and… blundered. Instead of rushing with 44. hxg6? he would have had a won position after the prophylactic 44. f4! While in the game with the subtle (or crude, if you take into account the threat of mate) move 45…Bf2! Karjakin “brought the white king into the game”. And all of the Chinese player’s extra pawns turned out to be totally useless. The white king dashed around like a hare but couldn’t find a secluded burrow. Perpetual check, and a draw. It’s a shame to spend time and effort pressing keys. The game isn’t worth it! Eljanov deliberately refused to fight for an opening edge in the Meran and got what he wanted – an absolutely equal and dull position, which he brought to a logical draw. A game of woefully poor quality. The players were clearly no longer up to conducting a struggle at a high level. White, it seems, was in too much of a rush in the opening to play the advance e2-e4, after which Black equalised with well-timed counterplay in the centre. Grischuk took great risks to play for a win, groundlessly sacrificing the b3-pawn and ending up in a lost position. Then Nakamura began “to put on a show”. The ending he had was absolutely won! Instead of 81…Qe2+ he had a forced win with 81…hxg3+ 82.Kg2 Qh4! 83.Nxe5+ Bxe5 84.Qxe5 Qh2+ 85.Kf3 Qf2+ 86.Kg4 g2 87.Qe6+ Qf6 88.Qg8+ Qg7, and the black king sidesteps with check. The decisive mistake was 84…Qf3? The banal 84…hxg3 and also the non-banal 84…Qe1! left Black with every reason to hope for a victory. While in the game White escaped. 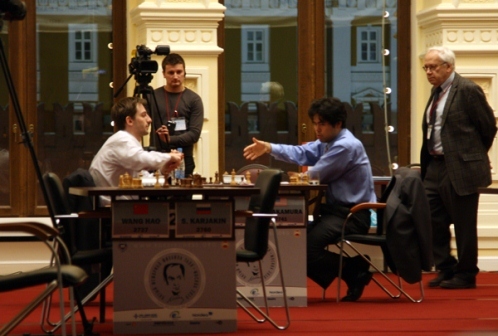 Grischuk was lucky! And rightly so. New elite tournament strategy: bring your daughter to the venue, after extensively coaching her on effective cheer-leading. This could lead to a new boom in grandmaster marriages. It’s well worth following the links to the photo reports, by the way! 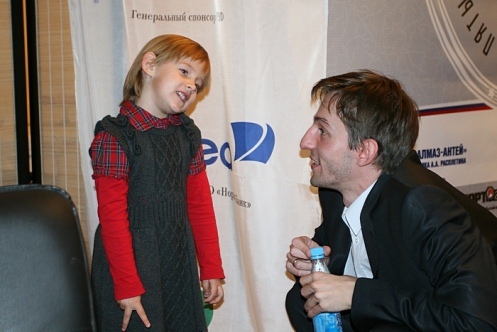 You can see far more of Grischuk’s daughter’s exploits – e.g. 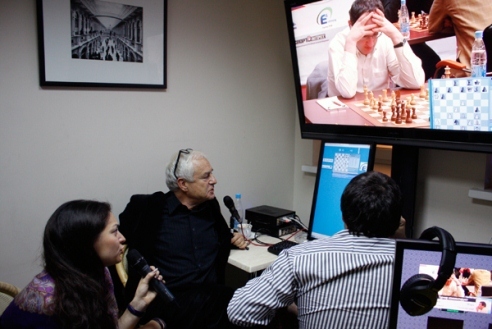 great photos of her at the demonstration board, or playing chess with Grischuk’s WGM wife.